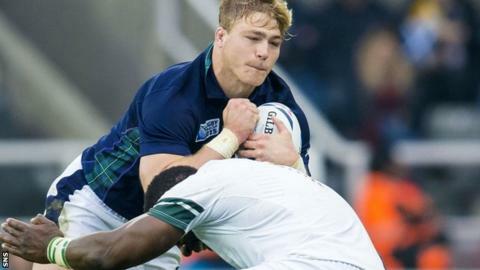 Former captain Andy Nicol believes it is "inevitable" that some of Scotland's World Cup squad will join Dave Denton in moving from the country. Denton has joined Bath from Edinburgh after the English Premiership club paid a transfer fee for the 25-year-old. "That's what happens at a World Cup," said Nicol, the former scrum-half who captained Bath. "You perform well and the big cheque books may open for you. "That's what happens to the Georgians and the Japanese." Nicol says Scotland's run to the World Cup quarter-finals will have alerted clubs to Scottish players. "You could get somebody here much cheaper than somebody who is established," he said. "It's inevitable that we lose a few players and Dave Denton is the first." Edinburgh are now preparing for the start of their European Challenge Cup campaign this week without Denton, who played 78 times over six years for the capital club. Glasgow Warriors also kick off their tilt at European glory in the top-tier Champions competition and Nicol believes that, after winning the Pro12 league title last season, Gregor Townsend's side have what it takes to do well this term. "They've got to kick on," he said. "Racing in Paris I think is a good start for them. "They won last week with a bonus point without playing well. That is the sign of a champion side. "Edinburgh went far in the competition last season and have now got a taste for it. I expect both clubs to do well this year."